Once off expense, years of free off-grid power and water supply. Even if the power is off you will still have water. Thus a secure source of life giving water supply. No more fuel expenses and no need to cart around cans of diesel. The pumps pay for themselves in a few months just on the savings in fuel and effort. Maintenance free, brushless, permanent magnet, low voltage DC motor, high efficiency, oil filled, submersible water pumps. Stainless steel pump body, non-corrosion materials used throughout. Designed to be used in harsh and remote areas. Ideal for areas where there is no eskom power available or where this is an expensive option to put up in terms of line and pole costs. Used to supply water for people, life stock & crops. This includes drinking water for domestic use, animal watering spots/cribs and irrigation. Can pump water from/to a borehole, well, aquifer, river, dam, tank, channel, etc. 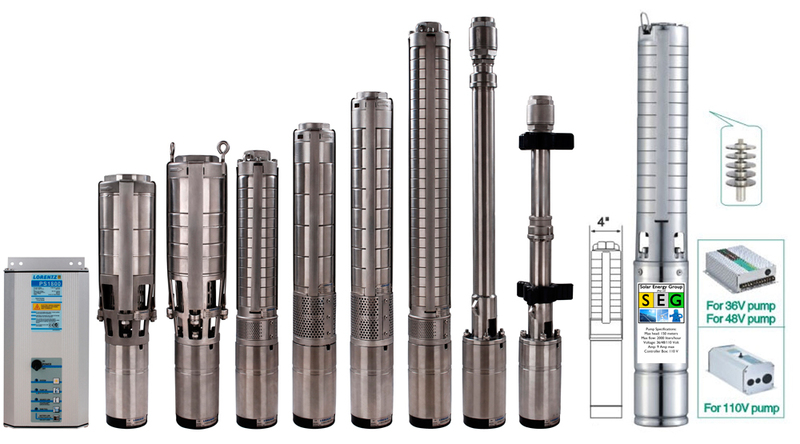 Low level/dry run protection well prod, tank overflow prod, extra screw or impeller included. The MPPT type control box ensures maximum power delivery to the pump. It also has a flow control limiter, fault protection, soft-start, over and under voltage protection as well as overload and over-temperature protection functionalities to ensure a long system lifespan. SEG does the assembly, making of connections, adding of fitting, etc in-house. Just connect your pipe, plug in connectors and put the pump into the water, the rest is taken care off. Solar water pumping works on a direct solar panel to pump energy conversion systems. Low voltage, high wattage, submersible DC water pump. Step 2 – Water requirement: Domestic use + animal use + irrigation use + storage = Total daily requirement / 6 or 7 hours per day = hourly requirement. Step 3 – Pump selection: We will assist you in selecting the appropriate pump for your purposes by looking at the above variables. Keywords: Franklin Electric, Grundfos, Franklin, Solar water pump, Solar pump, Solar Borehole Pump, Water testing, Lorentz, Taifu, Solar boorgat pomp, Borehole pump, Water resource management, Borehole testing. To get a free quotation on a solar water pump solution please fill in the form below or head over to the contact us page and get in touch!